Kris Gethin, transformer to Bollywood's Best Bodies. Bollywood Body by Design demonstrates how we can experience transformational success in just 10 weeks, spurred by an Indian cultural context. Known to constantly better the processes he has spoken of in previous transformation stories, internationally renowned body builder, transformation expert and author, Kris Gethin, explains how to develop superhero characteristics in order to control our environment and to face up to our fat-related fears. Indians from all walks of life around the world, who have successfully followed Gethin's plans to achieve transformation, share with us their inspirational stories. Gethin also talks of Bollywood stars Hrithik Roshan, John Abraham, and Ranveer Singh, amongst others, who have been his clients and experienced transformation under his guidance, coupled with their own steely determination. 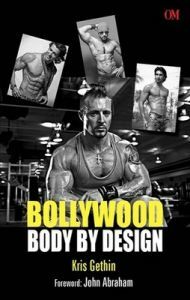 With customised 10-week workout programmes and a diet plan of close to 30 Indian recipes, Bollywood Body By Design is by far the most motivational, educational and inspirational reference book on transformational success written to date. Kris Gethin is the directer of trainers for Physique Elite, who transformed Bollywood stars such as Hrithik Roshan, John Abraham, Ranveer Singh, Arjun Kapoor, Imran Khan, Karan Johar, etc. He is CEO of both Nutrition by Design and Gethin Gyms. He is the founder of the most followed training principle in the world - DTP - and is the author of the bestselling book, The Bodybuilding.com Guide to Your Best Body (previously Body by Design). He is also the main male spokeperson for Bodybuilding.com and has amassed over 64 million followers for his Daily Trainer Video Series on Bodybuilding.com, making him the most watched transformation expert on the web. Kris Gethin is the directer of trainers for Physique Elite, who transformed Bollywood stars such as Hrithik Roshan, John Abraham, Ranveer Singh, Arjun Kapoor, Imran Khan, Karan Johar, etc. He is CEO of both Nutrition by Design and Gethin Gyms. He is the founder of the most followed training principle in the world DTP and is the author of the bestselling book, The Bodybuilding.com Guide to Your Best Body (previously Body by Design). He is also the main male spokeperson for Bodybuilding.com and has amassed over 64 million followers for his Daily Trainer Video Series on Bodybuilding.com, making him the most watched transformation expert on the web.